Having not seen a playground for nearly 3 weeks we headed to Kaya Aya food village which advertised having one. The first problem was that taxi drivers didn’t know the place. When we eventually found it we knew why. They have at least 3 names. Kaya Aya food village or market or square, needs to sort out its branding as the taxis know it’s there but with different names. Our little ones enjoyed the playground but is really for kids up to about 4 year olds, but it’s the only playground we came across in Bali. There are about 10 different restaurants in the food village which is next to the market selling clothes, jewelry and nicnacs. We chose Wacko Burger which has a very much a down under style menu. My wife went for the down beef burger which had the compulsory beetroot and fried egg. I went for the Hawaii beef burger having liked pineapple on my burgers since uni. 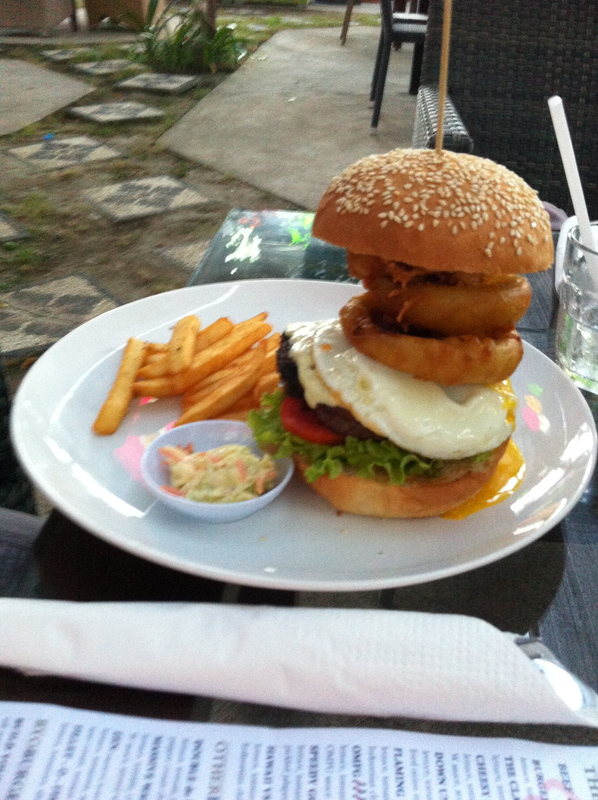 Both were stacked high and good, I understand their claim of winning the best burgers in Bali. For the girls we got their favorite of fish and chips. Add in a juice, water and beer and it all came to IDR 281,000. SGD 30 bargain! There is one thing that I’ve left out and that’s the compulsory tip for the serenading musicians. They were truly awful.